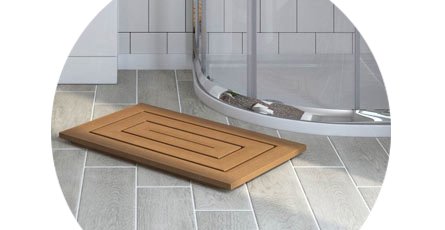 Bathroom duckboards offer you a safer way to step out of your bath or shower as they feature non-slip surfaces which are designed to prevent trips or falls. These bathroom duckboards are a great alternative to mats as they are a decorative touch that you don't normally see so they're great for adding some personality. If you have a bathroom with a bit of a rustic edge then placing a duckboard outside the bath or shower is a great way to keep this theme going. Brilliant item which stops our carpet tiles getting wet when in contact with the bath mat.